Dr. Douglas and Dr. Gallus talk about revision surgery after breast augmentation. A must watch for anyone considering revision breast surgery. Hi, I’m Dr. Trent Douglas with Restore SD Plastic Surgery and I’m joined today by my partner. . .
Today we’re going to talk to you about breast revision after prior breast augmentation surgery. Up to 25% of women who have had a breast augmentation will require a revision procedure during their lifetime. Most candidates have a history of breast surgery, either augmentation or reconstruction and are interested in improving their appearance. The most common reasons to have a breast revision procedure are size change or to address capsular contracture. Asymmetry, bottoming out, or just tightening the breast skin are also options that can be corrected with breast revision surgery. The procedures can involve an implant exchange, removal of the scar tissue capsule, tightening the internal breast pocket, and adding a breast lift to a previous augmentation. Additional materials may be required to optimize the results. We are Board Certified plastic surgeons with over a decade each of experience with breast surgery. 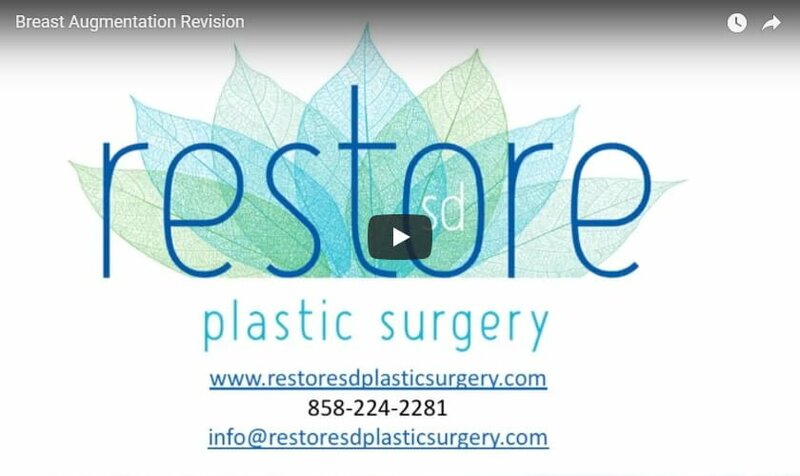 We welcome you to come see us at Restore SD Plastic Surgery.